Faux leather. Fake leather. Pleather. Whatever you want to call it, I don’t mind it one bit. It’s affordable and when done right, it can look like the real thing! If I saw this jacket on the street, I would never think it’s faux leather. This is a great option if you need an affordable jacket for under $100. The material is faux leather however it doesn’t look or feel cheap whatsoever. I love the cropped length and slim fit – great for petite gals! I can see this jacket paired with a dress, tights and ankle booties for a crisp fall day. Very versatile, available in three colors and would highly recommend! I rounded up some other faux leather jacket options for you below or if you prefer real leather, click HERE. I’ve been basically living in these olive jeans lately and can’t seem to get enough. It’s such a nice break from your typical blue jeans. I found some other great options if you want too add a pair to your wardrobe. 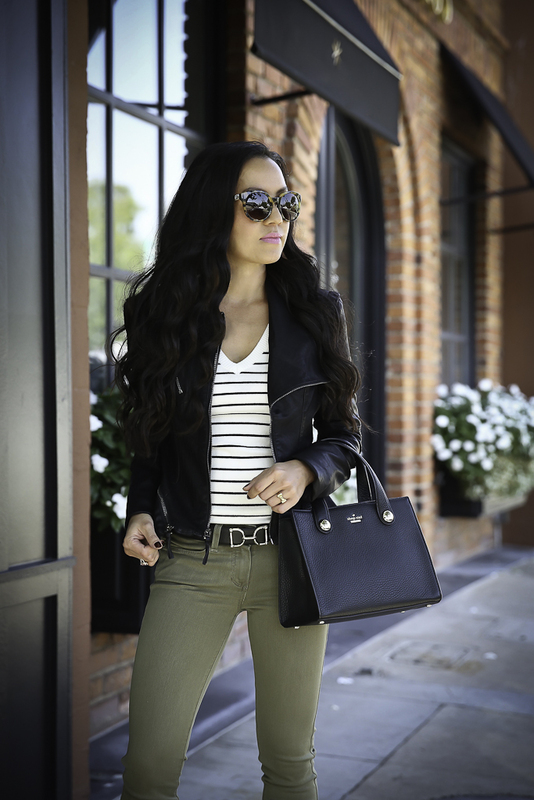 Here is another way I’ve worn these jeans – a little more casual and comfy for everyday wear. Clearly I love olive jeans (lol). I pinned this look! Fabulous! I love this outfit! The jacket is so cute! I hear you about the sleeves being too long – I have the same problem with jackets and coats. Wow.. nice post and you are looking stylish. I really like Dressup combination. Always like to wear my Fadcloset leather jacket at the time of the photo shoot. Which makes me more fashionable.